Thank you for the positive feedback I’ve received so far on my first simple meal post. I’m thrilled to know that I’m in good company while I suffer from a love of cooking/eating with not-enough-time-to-make-it-happen. Wait, let me rephrase. I did know I am not alone in this, but I’m thrilled to know that some of you want to read a blog about it. This means more frequent posting capacity for me, and (hopefully) more great food ideas for you. That said, I was asked (again) if my kids ate everything I posted about last time. (Yes, except for the grilled peppers). Which reminds me: a very important consideration when cooking meals for a busy family is “Will the kids eat this?” It’s a question I usually forget to ask myself because, a) my kids aren’t too picky and, b) I’ll make them eat it anyway. But from now on I will make sure to include the kids’ rating of the meal, what they ate happily, what they didn’t. My kids may be more or less picky than yours but still they’re kids and they don’t like a lot of vegetables and would prefer to eat cheese-based meals most nights of the week. 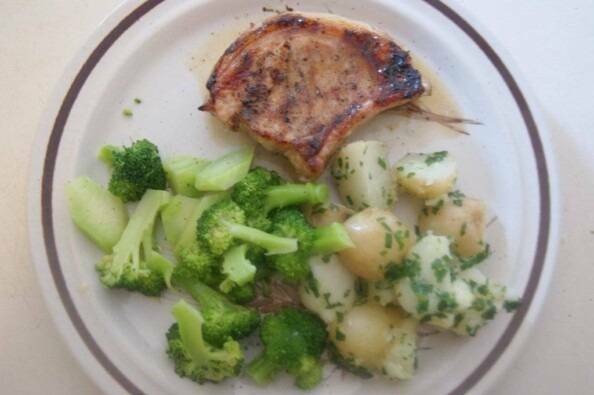 I came up with this whole simple meal writing idea on the day that I first made Brown Sugar Grilled Pork Chops. They looked so appetizing pulled fresh from the grill that I was inspired to take a photo right then. And it amused me to watch my children dive in with such gusto; their first experience with pork chops started with much more resistance. A thought came to me that I should blog about this, followed immediately by another thought that said no one would be interested. Not blog-worthy, in other words. But as I watched my children and their cousin devour the chops with ravenous speed, I changed my mind. We all need a meal like this – one that is tasty, easy, seasonal, and allows plenty of time for relaxing in the hammock. The chops came from Choux Choux, the broccoli and new potatoes from the supermarket, and the chives from my garden. The brown sugar pork chops is an idea I adapted from a dry-brined chicken recipe. Dry-brining usually takes at least 8 hours, but I thought I would try one hour on the chops just because it’s summer. It worked pretty well, although the chops would have been juicier with a longer brine. The chive butter is an old favourite of mine. I love chives, I love butter, and I love to marry the two with a variety of vegetables. Chives with butter and new potatoes is a marriage made in food heaven. In a small bowl, combine the brown sugar, salt, pepper and olive oil until a smooth paste forms. 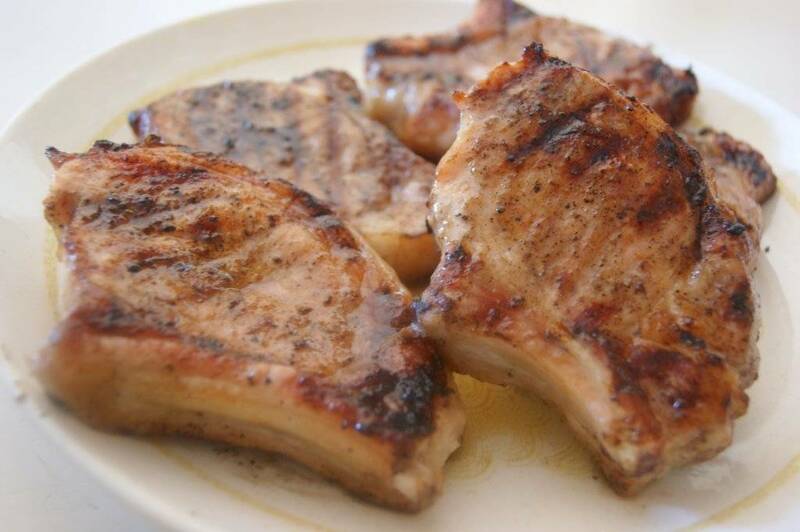 Pat pork chops dry with clean towel or paper towel. Spoon about one-half teaspoon of sugar paste onto each chop and rub to cover evenly. Flip each chop over and repeat spooning and rubbing on the second side. Use up all the paste. Set pork chops aside for at least 45 minutes and up to 8 hours. For the record, a longer brine time will give you much better results. If you can, brine the chops in the morning, refrigerate for at least 8 hours, and cook them at dinner time. 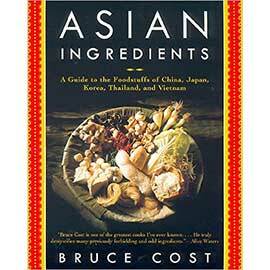 When you are ready to cook, light your barbecue and turn all burners to high. Pull the cover down and heat for about 10 minutes. 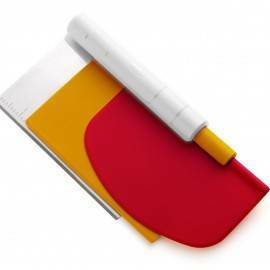 Use wire brush to scrape cooking grate clean. Create a two-stage cooking area: leave one burner on high and the other burner(s) on very low. Place chops over hotter part of grill and cook until browned on each side, about 3 minutes per side. Move chops to cooler side of grill. Cover and continue cooking, turning once, for 7 to 10 minutes, depending on the thickness of your chops. The ones from Choux Choux were different sizes, so I pulled them off a different times. 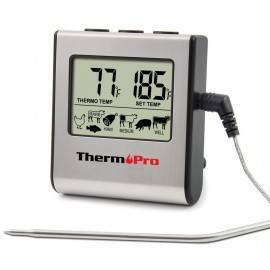 If you have a thermometer, insert it into the center of the meat, away from the bone. The chops should register 135-140 F before pulling off the grill. Transfer chops to platter and let rest at least 5 minutes. The internal temperature should rise to 145-150 degrees or so. Serve immediately. A marriage made in food heaven. Wash the potatoes in cold water; drain. Cut potatoes into halves or quarters, depending on their size. Some nuggets will be small enough to leave whole. Make sure that all the potato pieces are about the same size so that they cook evenly. 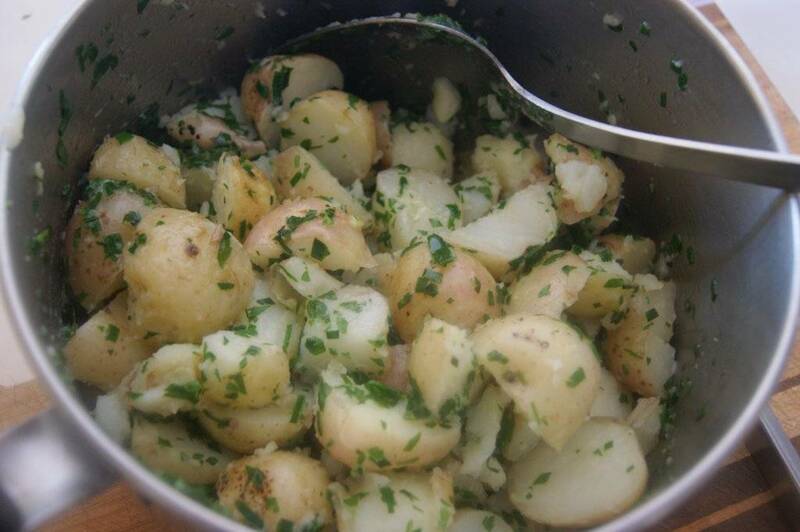 Place potatoes in a medium pot and cover with cold water. Add the salt. Place pot on a burner and turn heat to high. Bring to a boil, reduce heat to low and cover. Potatoes should simmer very gently for about 10 minutes. Meanwhile, combine the chives, butter, and parsley in a small pot. Place on a burner over low heat. Let butter melt and herbs wilt. Turn off heat. The potatoes will be ready when they can be pierced with a fork, but make sure not to over cook the potatoes. They should still hold their shape. Drain potatoes and immediately return them to the pot. Shake them around (on the heat if necessary) until they are dry. Now add the chive butter mixture and stir to coat the potatoes.